From Casa Magazine published November 28th, 2014. Earlier this year, The Fund for Santa Barbara awarded a 3-year grant to Just Communities for their Language Justice Initiative (LJI). Recently, we sat down with the Just Communities staff to learn a bit more about their work in the emerging field of Language Justice. The idea behind language justice or language access is simple: all people should have the opportunity to participate fully in their community, and language should not be a barrier. Most people are supportive of this in concept. Many of us, after all, come from multilingual families and communities. According to the U.S. Census Bureau, 40% of Santa Barbara County residents speak a language other than English at home. The challenge lies in changing the way organizations and institutions work so that language is considered from the very beginning, whether planning an event, offering critical services, or holding a public hearing. According to Jarrod Schwartz, Executive Director of Just Communities, the LJI grew out of Just Communities’ first-hand experience of working with parents and schools through their PIDA Program (Parent Involvement through Dialogue and Action). Meetings and workshops would frequently stop because schools didn’t have the language capacity to continue the work. High quality interpretation requires a great deal of skill and training. Realizing the need – and true to their own principles of “walking their talk” – Just Communities started by developing their own internal capacity and skills. By changing their own practices, they soon realized the scope of the need in the larger community. Once they’d developed the ability to provide high quality multilingual spaces, they wanted to share what they’d learned and assist others in following suit. Samuel Duarte, Project Coordinator for Just Communities’ Language Justice Initiative, leads the effort to make these goals real. According to Mr. Duarte, “all people have the right to have their language(s) respected and recognized. We believe that comprehensive language access is a fundamental part of a just and equitable society. Language access empowers all people to be full participants in matters of interest and concern to ourselves, our families and our communities”. To put these ideas into action, Just Communities has created a number of language justice workshops and training opportunities, and serves as a consultant and advisor to school districts, nonprofit agencies and community groups. The SBUSD has moved from having one half-time interpreter on staff to three (and a half) full time interpreters. Dos Pueblos High School, Washington Elementary, and Monroe Elementary now conduct all PTSA meetings via bi-directional, simultaneous interpretation. Because of the expanded language access, the Engineering Academy at Dos Pueblos High School went from having just a handful Spanish-speaking families attend their open house events to over 100 Spanish-speaking families. The American Red Cross has cross-trained their volunteers with LJI to ensure that in times of disaster non-English speaking members of our community are able to receive the life-saving information they need. And the work continues. 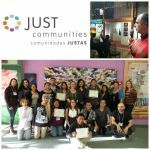 If you’d like more information about Just Communities and the Language Justice Initiative, go to http://www.just-communities.org, email info@just-communities.org or call (805) 966-2063.